Home / Arsenal News / Can Arsenal erase the memory of another poor premier league start? Can Arsenal erase the memory of another poor premier league start? Pardew’s side won away at newly promoted Norwich and will be buoyant over their start, Selhurst Park is always a difficult place to go especially when morale is low. The former Chelsea shot stopper will be eager to make amends for his two errors at home to West Ham last Sunday, Cech is still settling into life at Arsenal after 11 years at Stamford Bridge. The Czech Republic keeper has a lot to prove after his disapointing debut but will be hoping he can keep a clean sheet at Selhurst Park and build on it when they entertain Liverpool on the following Monday. The young Spaniard missed the opening day defeat due to illness but should be back in the fold for the trip across London, Mathieu Debuchy took his place at home on Sunday and looked short of what is required, he looked very jaded and is expected that Bellerin, a former La Masia graduate will start. Bellerin had a breakthrough season in Arsenal’s last campaign and is deserving of a first team place, he gives Wenger’s side another dimension going forward and has shown a good understanding of his defensive duties at such a young age. The tall German central defender has had his critics in his time at Arsenal, but their Vice Captain is an important part of the squad. Mertesacker still has a very good understanding of the defensive side of the game, and his experience will be vital this season. Koscielny has become Arsenal’s most reliable defender over the past few seasons and a fan favourite, he has established a good relationship with fellow centre half Mertesacker and they will likely continue their partnership on Sunday. Monreal has now become Arsenal’s first choice left back after some fine performances last season, the Spanish defender took full advantage of Arsenal’s “defensive crisis” last season when he was asked to fill in at centre half which if anything helped him develop more of an understanding with his back four. Arsenal’s holding midfielder was another who was below par last weekend and will be looking to bounce back, he was a revelation last season and was one of the reasons Arsenal yet again went on a good run til the end of the season- which culminated in another FA Cup triumph. He will be key to any points they may take away from Palace on Sunday, his main job will be to keep new signing Yohan Cabaye quiet on his home debut. Cazorla was out of sorts at the weekend, the creative midfielder was played further forward than he was last season and looked uncomfortable. He will more than likely play alongside Coquelin as he did for much last season where he excelled. The Welsh midfielder could find himself on the right hand side of the front three as he did for much of last season, which was effective. Ramsey will naturally come inside which will allow Bellerin space to provide width, this is something that worked very well in certain games last season, especially in the 4-1 home win against Liverpool. The Chilean was introduced late on in defeat at the weekend and looked a bit ring rusty, he is expected by many to start the game in his favoured left wing position which saw him hit the ground running in his first premier league season last term. The forward scored 16 goals in 35 appearances and will be key again this season for Arsenal. Following a few starts up front in pre-season for Walcott many expected him to start in the centre forward position at the weekend, Wenger plumped for the tried and tested option of Olivier Giroud which never really worked. Walcott showed at the end of last season that he is capable of leading the line, has good movement and can be clinical given the opportunity. It is vital that Arsenal bounce back immediately after opening weekend disappointment, it is never easy at Selhurst Park with Palace having a more than competitive record with the “top four”. 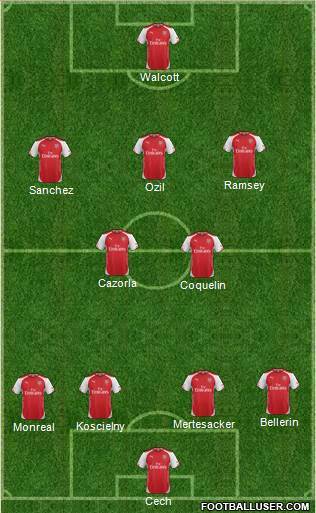 Wenger’s side will need to win the battle for the right to play and then capitalise on what chances they create. ← Previous Story Does Petr Cech have a lot to prove, following his below-par debut?